I am often asked, “what is one piece of decorating advice you would give”. I never hesitate to share my passion (I am a little dramatic) for curtain height. It might sound silly or as though it really wouldn’t matter, BUT, you, my friend, would be W-R-O-N-G (again, a little dramatic). When I walk in a client’s home and see their current curtains are either flooding (you know, like they are a pair of capri pants) or not hanging high enough, I know I am about to change the entire feel of their room. I always start by measuring the ceiling height. Then, I measure the height of the floor to the top of the window. The sweet spot is as high as you can go without hitting the ceiling (leave about 2”-3”). A close second is the middle space between the top of the window and the ceiling. The worst place is at the top of the window (you are shrinking your room). Rarely do I use curtains shorter than 96”. I love to use between 108”-120” depending on the ceiling height. Another overlooked detail is the curtain rod placement. Often people will put their brackets right beside the window. Go out! Create the illusion that your window is larger than it is. Lastly, get a panel that is the width of your window. This way, when you have two panels it creates a much fuller look. The diagram below is all the same window (now you will do a double take)! See the difference?!?!?! I promise, this one change in your home will create a big difference! Take before and after pictures and send them to me and lets cheer together! 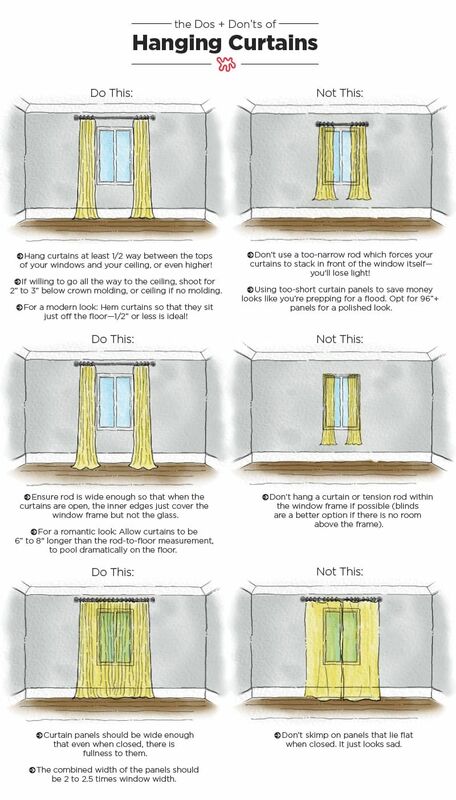 ​ Need help finding the right curtains for your space? I can help! You can reach me at johnnaholddesigns@gmail.com or via instagram @johnnaholddesigns. Here is a little backstory of my love affair with M/I Homes: In 2015 Will and I were on the hunt for the right home for our family. We had needs and wants but we also had a budget (gets you every time). We knew we wanted to build and were pretty set on location; however, the builder was up in the air. We toured and toured model home after model home, spec home after spec home until one fateful day, on my own, I walked into the M/I model home (knowing they were new to our area) and called Will before I even made it back to my car. I told him, "this builder fits in line with our style and budget perfectly, and they have several floor plans we can work with". Looking at their website we were able to locate all of their model homes in our area and we visited every single one (trust me, we were known in the M/I community after our tour of homes). We met with Ursula, our amazing sales rep, and were thrilled with the possibilities M/I could provide us with. If you have ever built a home you know that the term "base price" should be used VERY loosely. With M/I Homes we were pleasantly surprised they were not the norm. Now, don't get me wrong, Will and I did some big upgrades (third car garage, turning a half bath into a full, and making an office a bedroom) and some minor upgrades (hardwood tile throughout, customizing tile work in kitchen and baths, etc...). But, a lot of the wow factors were base price options with M/I (i.e. : 42" custom cabinets, 8 ft. doors, tankless water heaters, covered patios, 5 1/4" baseboards, granite counter tops throughout, etc..). This, along with their well deisgned floor plan options and aesthetics made it the perfect fit for our family. Their website says it perfectly, "each home has been built with uncompromising quality, innovative design and enduring value in the best, most desirable locations possible. M/I Homes believes the more you know about the home building and buying process, the more comfortable you'll be." So now you know where I stand with M/I Homes! When M/I Homes introduces a new floor plan, it is a must see. I was given the chance to visit two of their new models in Paloma Lake and I jumped at the opportunity! The first model I toured was the Channing in their Legacy Series, it is the 2 story version of the Brenham floor plan. Boasting 4 bedrooms, 3 baths, 2 powder, a game room, and office the layout feels spacious without being wasteful. The game room is perfectly positioned at the top of the stairs for a great escape. While the layout is spot on, the details are not to be overlooked. With the beams in the dining room, perfectly placed windows in the kitchen, double master closets, and conveniently positioned laundry room, you will be hard pressed to name your favorite feature. The McKinney Model is in their new Signature Series. It is right around 2,300 sq. ft. and is a spacious 1 Story. With 3 bedrooms, 2 baths, and the neatest playroom you will walk in and immediately feel home. As I was touring the McKinney I loved the layout and open concept of the kitchen, living, and dining rooms BUT when I rounded the corner and saw the playroom nestled between the two spare bedrooms, I was done for. As a mom of two kids I couldn't help but picture my family in this space. Personally, I would rather have a smaller home that functions rather than more square footage and wasted space. M/I Homes has cornered the market on smart use of space, in my opinion, and the McKinney is proof. Like all M/I Homes they have multiple upgrade options. The design center is a decorators dream (I was in HEAVEN). They have so many incredible options to choose from and an incredible staff that will help you along the way. While the design center was right up my alley, it can be a source of stress for most. Rest assured that their team will come alongside you and assist you in making the best decision for your home. As for the Holds, not a day has gone by that we have not been so happy with our decision! If you are in the market for a new home, do not sign on the line until you visit an M/I Home.